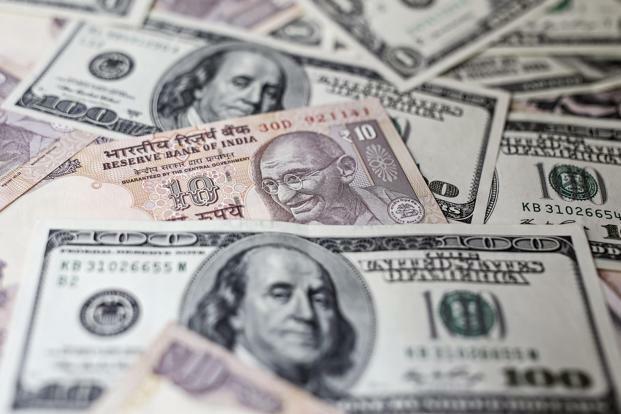 Mumbai: The Indian rupee on Monday weakened marginally against the US dollar on worries of higher crude oil prices and tracking losses in Asian currencies. At 2.10pm, the rupee was trading at 68.08 against the US dollar, down 0.10% from its previous close of 68.01. The currency opened at 68.16 a dollar and touched a high and a low of 68.07 and 68.16, respectively. Last week, Brent crude topped $80 a barrel for the first time since 2014 amid signals that stockpiles of excess oil will continue shrinking around the world. The 10-year bond yield stood at 7.827%, down from its Friday’s close of 7.833%. Bond yields and prices move in opposite directions. So far this year, the rupee has weakened 6.2%, while foreign investors have bought $599.40 million and sold $3.51 billion in equity and debt markets, respectively. Benchmark Sensex Index fell 0.56% or 193.69 points to 34649.51. Since January, it has gained 2.3%. Asian currencies were mostly lower as the dollar’s strength was boosted by news the US and China have called a truce over their trade dispute. South Korean won was down 0.61%, Japanese yen 0.29%, Indonesian rupiah 0.23%, Philippines peso 0.22%, Taiwan dollar 0.20%, China offshore 0.14%, Malaysian ringgit 0.10%, Singapore dollar 0.05%, Thai baht 0.04%. The dollar index, which measures the US currency’s strength against major currencies, was trading at 93.844, up 0.22% from its previous close of 93.637.